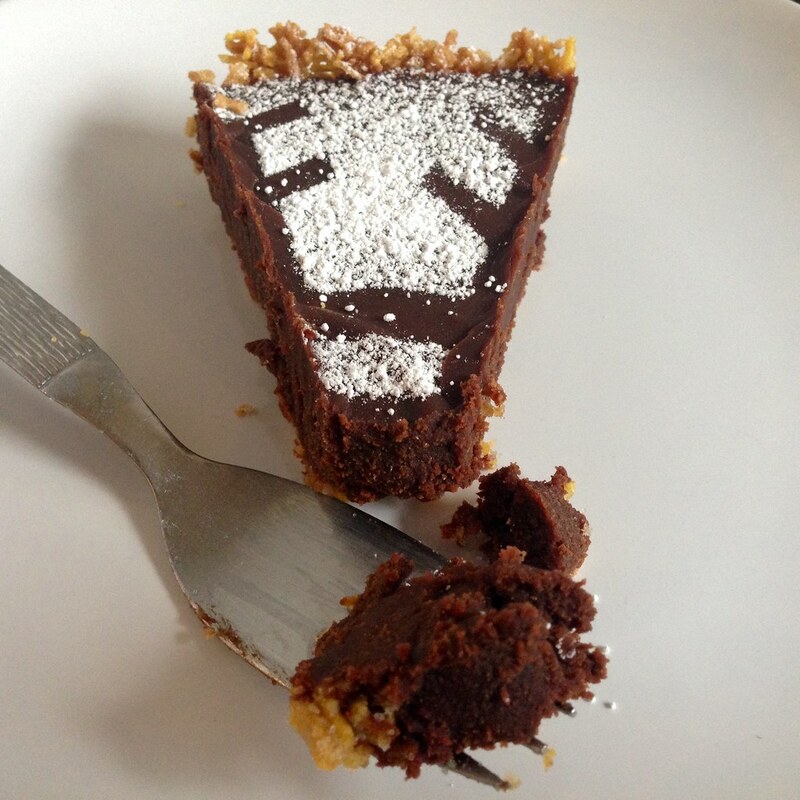 This dessert should really have another, more elegant name, like Peanut Butter-Chocolate Ganache Tart, but since it's based on the Puppy Chow treat, that's what I'm sticking with. If you've never heard of Puppy Chow, it's the snack mix you get when you coat Crispix cereal with melted chocolate and peanut butter, then shake it in a bag with powdered sugar. (Chex markets a version made with their cereal as Muddy Buddies.) It's super addictive, messy to eat, and utterly delightful. I was just thinking about making a batch the other week, so when I saw this post on The Crepes of Wrath for a Muddy Buddy Pie, I was inspired to make a Puppy Chow version. As a word of caution, this is a super, sinfully rich dessert. There's the buttery cereal crust filled with peanut butter-chocolate ganache and topped with a dusting of powdered sugar. 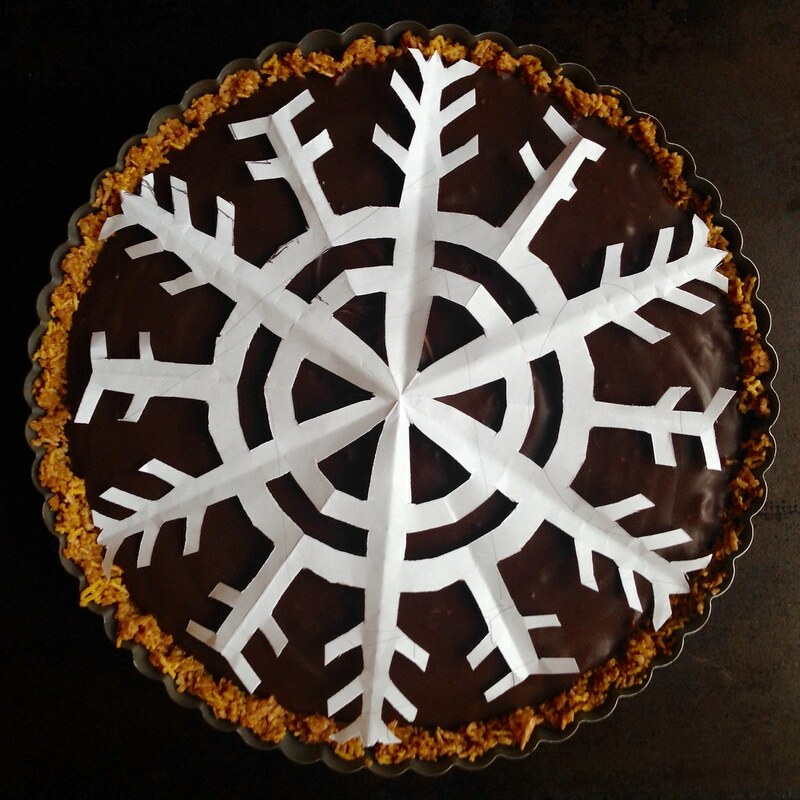 I found that making a snowflake out of a 8 1/2" square of paper gives you the perfect sized template to cover the top of the pie if you want to make a pretty design. It would probably make more sense to cut out a negative space snowflake so that the white part of the design is the snowflake itself, but I decided not to so that more of the top would be covered by the sugar. Preheat the oven to 350°F. Use a blender or food processor to grind the cereal into fine crumbs (if using a blender, you may have to do this in batches so that you don't end up with fine powder at the bottom and large pieces on top). Mix with the melted butter, brown sugar, and salt until well combined. Transfer the mixture to a 9" pie or tart pan and press into the sides and then the bottom. Bake for 10-12 minutes until golden, but not caramelized. Let cool while you make the filling. In a small pot, heat the cream and vanilla over medium heat until simmering. Place the chocolate chips and peanut butter in a medium, heat-proof mixing bowl and pour the hot cream over the chocolate. Stir until the chocolate has melted and the mixture is smooth. Pour into the crust and chill overnight, or at least 6 hours. 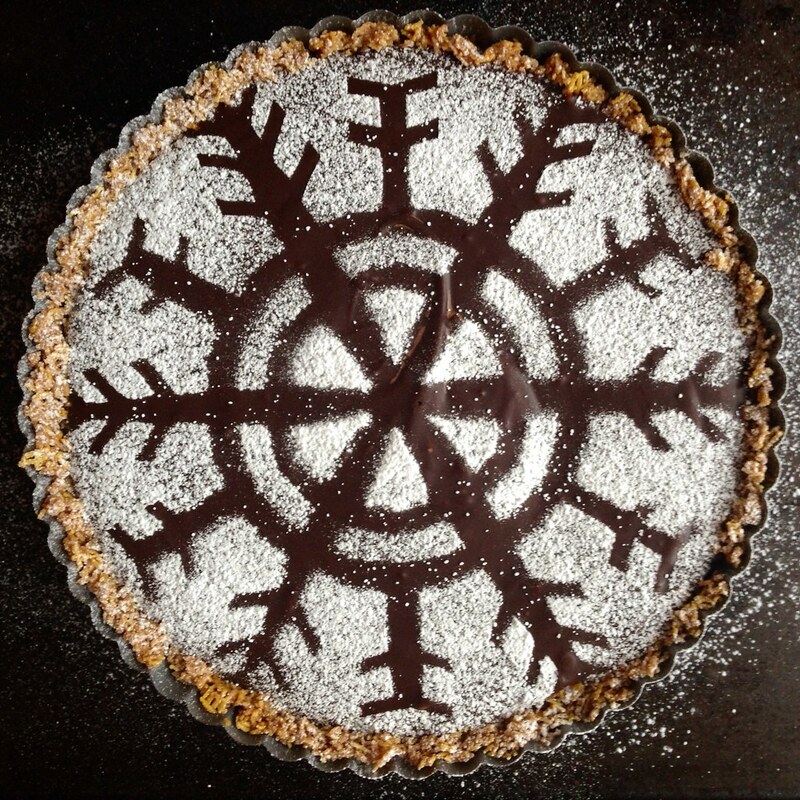 If using a snowflake template, place on top of the pie and then dust with powdered sugar. Serve small slices chilled or at room temperature. I hosted Thanksgiving for my friends this year and ended up with a ton of leftovers: turkey meat, mashed potatoes, candied sweet potatoes, stuffing, and cranberry sauce. The one dish that was all gone (or claimed by guests) was my corn souffle! 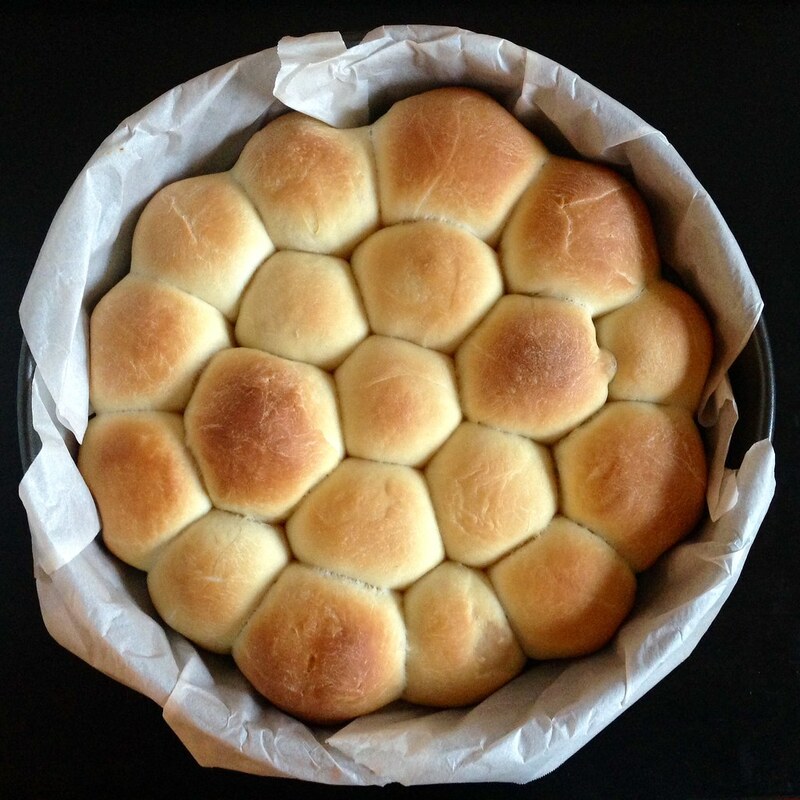 I didn't mind having all the leftovers, though, because I've been wanting to make pull-apart stuffed bread after seeing this post a few weeks ago. 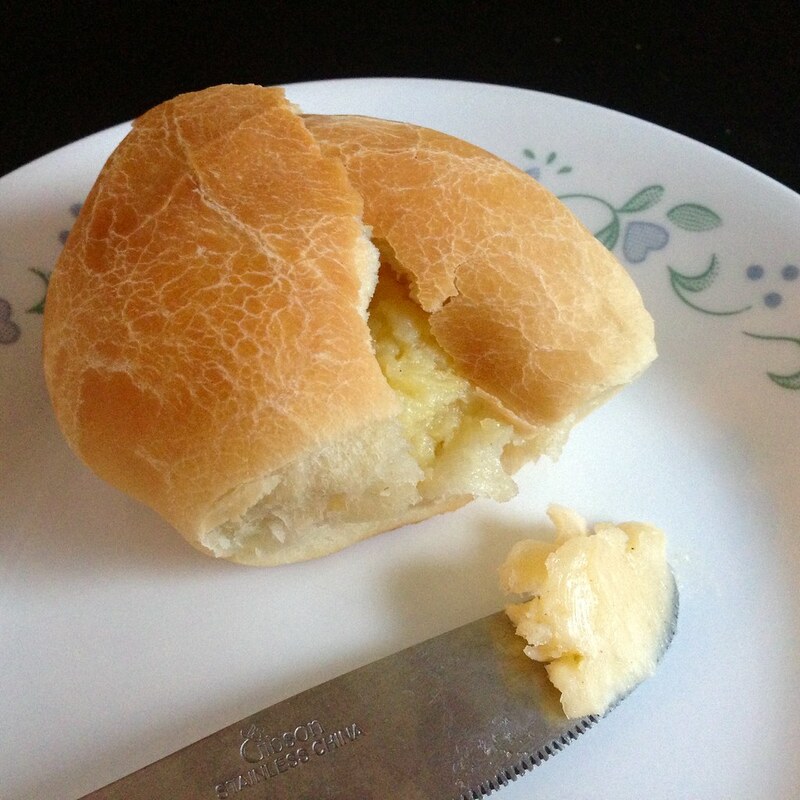 I decided to make the bread dough using Two Red Bowl's simplified recipe for Hokkaido milk bread, which turned out wonderfully soft and fluffy, just like the ones I made before. This time I used the tangzhong method, which means first making a cooked flour paste (the tangzhong). This paste is incorporated into the rest of the dough and is what makes it so soft and fluffy. In terms of the types of filling, I'd go with softer, mushier textures like mashed potatoes, stuffing, or sweet potatoes and stay away from anything that could possibly poke through the dough like fresh green beans (canned green beans might be okay). I ended up stuffing each roll with a bit of all the different leftovers since that's how I roll, but you can stuff them however you like. To make the tangzhong, whisk the water and 2 tablespoons of flour together in a small saucepan until there are no lumps left. Heat over medium-low heat, whisking all the while, until the mixture just starts to gel. As soon as lines start to appear in the mixture when stirred, remove from heat and allow to cool to room temperature. Heat the milk to about 110°F by heating in the microwave for 15-30 seconds. Sprinkle the yeast over the milk and set aside to allow the yeast to activate, about 5-10 minutes. Sift or whisk together the rest of the flour (2 3/4 cups), salt, and sugar in the bowl of a stand mixer. When the yeast is ready, add the tangzhong and egg and whisk to combine. Make a well in the flour mixture and pour in the wet ingredients. Stir until the mixture forms a loose, shaggy dough, then use the dough hook of the stand mixer to knead until the dough forms a semi-smooth ball. Add the butter to the dough, one tablespoon at a time, kneading after each addition. Knead until the butter is fully incorporated and the dough becomes smooth and elastic. 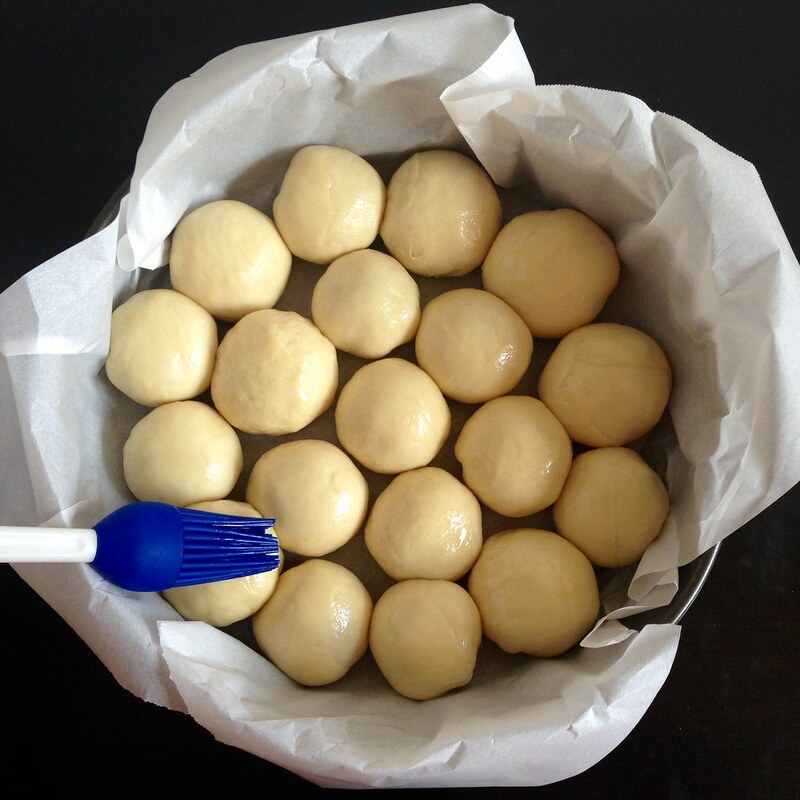 Place the dough in a large bowl with plenty of room and cover loosely with plastic wrap or a damp towel. Let rise for 1-2 hours in a warm, draft-free area, or until well-doubled. Alternatively, let the dough rise overnight in the refrigerator; the dough should be fine for up to 24 hours. 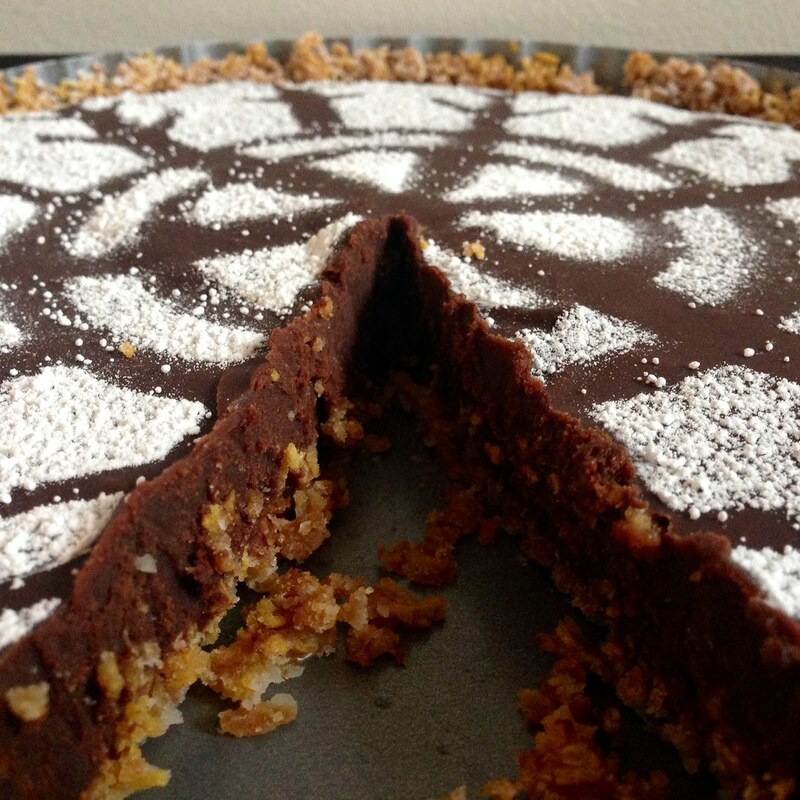 Line a round cake pan or square brownie pan with parchment paper. Once the dough has doubled, punch it down and divide into 24 even pieces. You can either use a food scale or divide the dough in half three times and then into thirds (2 * 2 * 2 * 3 = 24). Working one a a time, roll out the dough into a flat circle about 3" in diameter. If you can, try to make the edges thinner than the middle, but it's not super critical. Drop a heaping tablespoon of Thanksgiving leftovers onto the middle of the dough. Bring the edges of the dough together and seal. 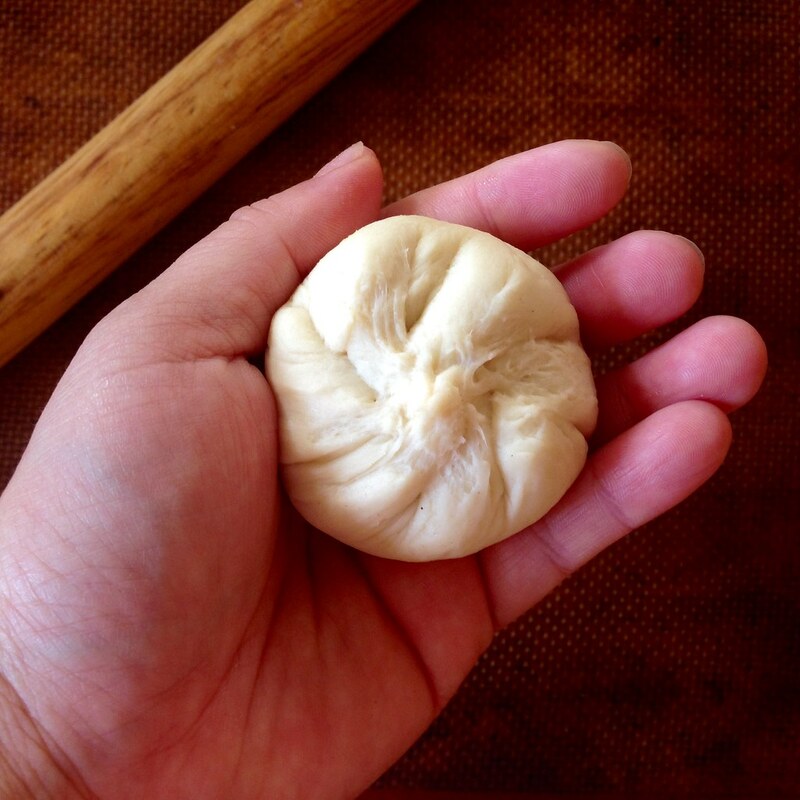 I like to do this using the method I learned to wrap xiao long bao, but since the seal will be concealed on the bottom, it's fine to just bring four opposite parts of the dough together and then pinch together the edges in between together. You just want to make sure that the filling is sealed inside. Roll the ball a bit in your hands to reform a sphere. 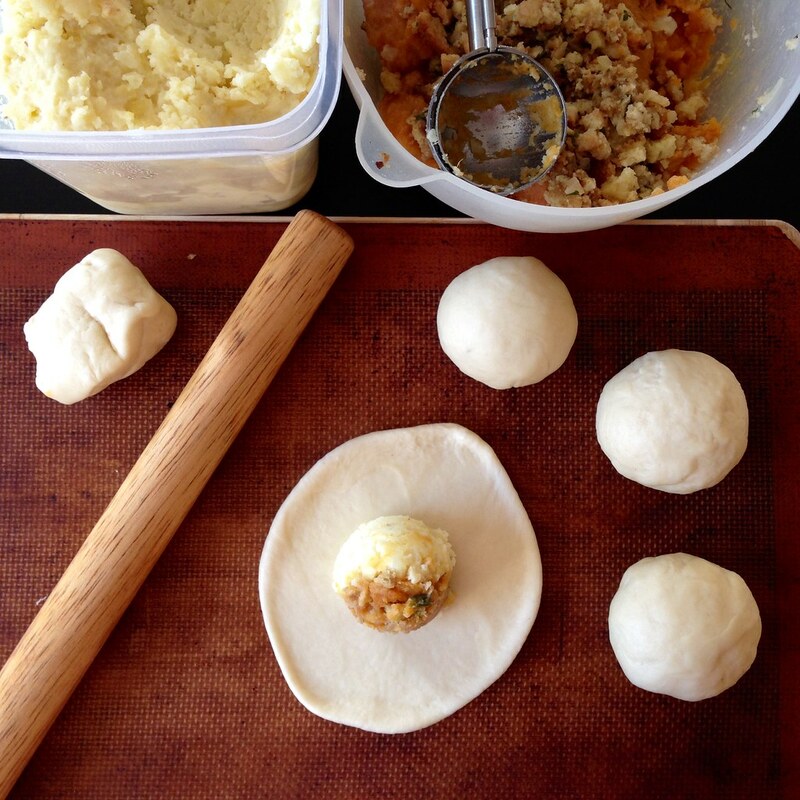 Arrange the stuffed dough balls seam side down in the prepared pan just so they touch each other. You may run out of room in the pan (I could only fit 19 balls, so I set the remaining in a smaller baking dish). Brush the top of the rolls with olive oil and let the dough proof again until they are almost doubled, about another hour or so. Preheat the oven to 350°F. 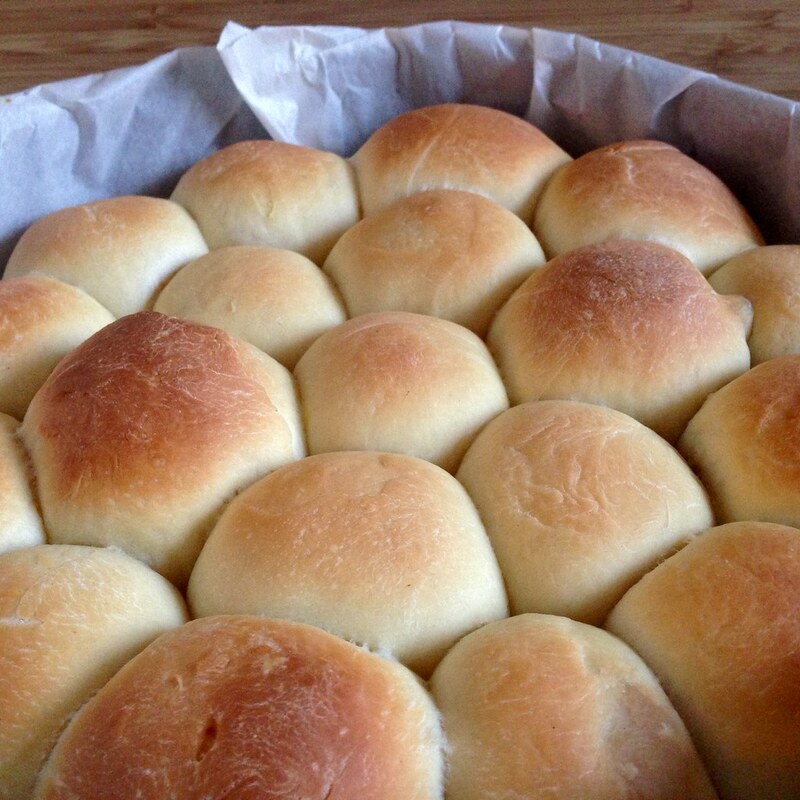 Bake the rolls for about 25-35 minutes, until golden brown. Serve warm with butter and any leftover cranberry sauce and/or gravy.